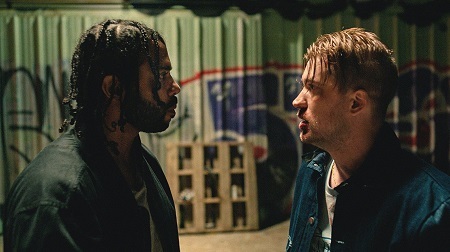 Few films this year have slapped me as hard across the face as Blindspotting did. 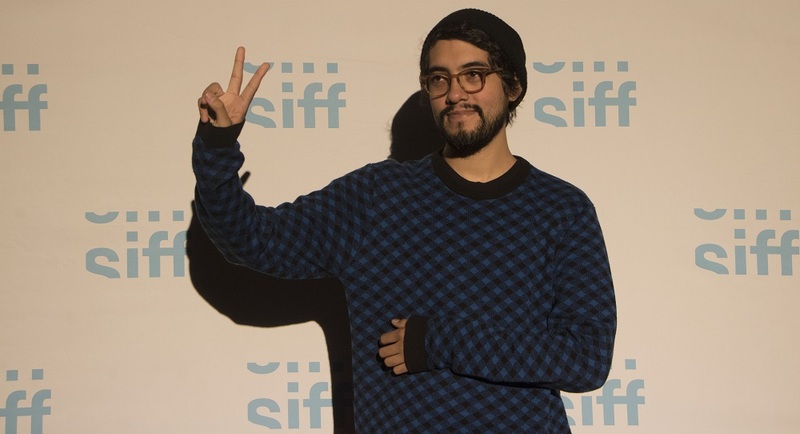 Written by its multi-hyphenated stars musicians, poets and theatrical impresarios Daveed Diggs and Rafael Casal, and directed by relative newcomer Carlos López Estrada, this three-day slice of life in today’s Oakland, CA is downright masterful. Weaving a variety of hot button themes and ideas into its scenario including subjects pertaining to police brutality, gentrification, gun control and racial identity, there’s so much food for thought it’s close to impossible to take it all in and process what’s happening in a single viewing. It’s fantastic stuff, and there’s really not a lot more to say. The story follows Collin (Diggs), an Oakland native currently on probation for a massive mistake in judgment where he let his anger and his frustration with the world at large explosively get the better of him. With only three more days to go before he’s free of supervision and his debt to society has been paid, just before midnight and while driving back to the halfway house he has the misfortune of witnessing a police shooting where an unarmed Black man is killed. Knowing he can’t afford to report what he’s seen, Collin continues to work his professional moving job with best friend Miles (Casal), an explosive hothead whose bad decisions have unfortunately gotten both men in more than their fare share of trouble in the not-so-distant past. There’s so much more going on here, including the fact that the woman running the moving company Collin and Miles both work for just so happens to be the former’s ex-girlfriend Val (Janina Gavankar), but the less the viewer knows about the ins and outs of the more intricate aspects of the plot the better. The key takeaway is that Diggs and Casal’s script is a freewheeling, cleverly complex piece of narrative imagination that’s as entertaining as it is thought-provoking. Estrada directs with absolute confidence, the film building to a revelatory moment eye-opening catharsis that left me sitting in my theatre seat shattered and stunned. Sara Michelle Fetters: Were you surprised at all that Daveed Diggs and Rafael Casal, even though you’d worked with them on their videos, gave you this script and basically asked you, “What do you think?” This is your feature debut, after all, and the material is undeniably challenging. Did it come as a shock that they knew you could pull it off? They just had no time. We had no time. We had no time to think about this, my directing, too much. This was a kind of thing where I think the producers told them, maybe late March, that the movie could happen in the summer [of 2017] and they needed a director right away. Sara Michelle Fetters: That’s incredible. Carlos López Estrada: It was! Two weeks after I said, “Yes,” we were prepping the film in Los Angeles. I don’t know how we did it. 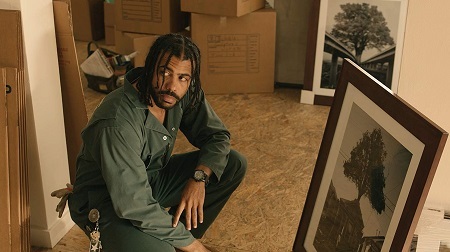 At that point, you look back now and while [Blindspotting] is a movie that we’re all very proud of and just ecstatic all these fantastically talented people came on board, back in the beginning it was only a movie that didn’t have a lot of money, that was very ambitious, that needed a significant rewrite and they wanted us to start filming as soon as possible. The amount of work that needed to happen in the amount of time was almost just impossible. I almost can’t believe we thought we could tackle it. Carlos López Estrada: We did. I think that’s where it helped we had history working with one another. We knew each other. We’ve been working together for years. We’d done projects. I mean, nothing like Blindspotting, but we’d done projects that on paper seemed impossible and somehow managed to pull off, so I think they trusted my ability to ground their larger-than-life ideas. Also, all the projects that we worked on were in many ways really dealing with all these different, multi-disciplinary, cross-platform ideas like spoken word, music, rap and theatrical-driven film stuff. I think that all of these factors made Daveed and Rafael think that maybe it wasn’t all that crazy to offer the job of directing their movie to me. Carlos López Estrada: I keep telling people that by the time it hit me that we were making a movie we were already done shooting. We had no time to have too much stress over anything. I think most people, most of my friends who are working on their first movies, you usually don’t have the luxury to prep it properly, have months and months to plan a shot list, to storyboard it and to cast. That’s a luxury. But I also think that much time allows you to get into your head and to second guess everything you’re doing. It also allows other people to question what you’re doing, which can definitely be problematic. I think just the timeline for us didn’t allow for any of that, so we were just acting on our toes, getting all these curveballs and improvising. Carlos López Estrada: The thing that I was drawn to, before even having read the script, is just knowing Daveed and Rafa, knowing them as artists and having worked with them for so long. They’re the kind of people that I know who wouldn’t do a project unless they felt like it was worth their time, wouldn’t do it unless they felt like it was important to do right now. I hadn’t signed the contract or anything but I essentially said I would do [the film] before I even read the script just because I knew that they were behind it. That was enough. Daveed and Rafa had talked to me about what they wanted to accomplish with the story. That was enough of a selling point for me. But after reading it, I was very moved by how human that the story was. But I was also struck by how exciting it was, too. It’s like a very human story told in the most exciting of ways, and I know how much it meant to them to portray Oakland in a way that they had never seen before. I know how much it meant to them to tell this story that was inspired in all of the places and people that they knew, by events that they grew up surrounded by. Sara Michelle Fetters: Obviously, this movie couldn’t be timelier, and not just in its dealings with subjects pertaining to race. I mean gentrification, the corporatization of major cities and this influx of money from the tech industry, all of that feeds into this giant mélange. How do you separate all of those pieces so that you tell one, coherent story, and not allow any one to overshadow the other. This very easily could have just been a movie about race. It could have been about gentrification. It could have been about gun violence. It could have been about any one of the many themes you all are tackling. But it’s not. It’s about all of them. 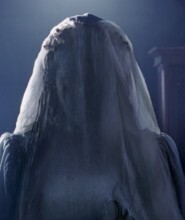 Carlos López Estrada: That’s what was most appealing and was also most challenging about the movie. It deals with so many timely and important and very complicated issues. It also, just tonally, is all over the place. It’s a comedy, but it’s also a drama, and it’s also sort of a psychological thriller. We would talk about the references in other movies that we were watching when we were prepping. You would just think all of this would be a recipe for disaster. 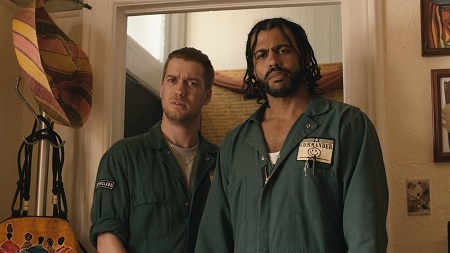 We were watching movies like Friday, and then we were watching movies like The Shining, and then we were watching movies like Jackie, and I can’t imagine any other movie that’s like Blindspotting that would allow for those influences to all coexist. It was a real challenge to figure out how to do so much in 90 minutes and also make it not the most overwhelming cinematic experience that people could ever watch. It required a lot of conversations, and it required a lot of fine tuning to make sure that we could strike that balance and make sure that the comedic moments weren’t detracting from the drama, that the dramatic moments weren’t detracting from the comedy. I think that process helped us a lot. We were dealing with all these things and wanted to do so in a way that came from a place of respect but also in a way that was informative and entertaining but never in a way where it felt like we were shoving ideals down anyone’s throats. Sara Michelle Fetters: I think “Respect” is the right word. Not only do you show respect to your characters in this film and present them in a very complex, if not always flattering, light, but you also respect your audience, too. All of which has got to be a difficult in the context of a film like this one. How did you balance all of this? Carlos López Estrada: It is very difficult. Definitely. I think Daveed and Rafa could probably speak more accurately to this from a writer’s point of view, but for me, I think it was the only way I decided I could approach the material because I’m not from Oakland and yet I’m telling an Oakland story. I’m not African-American and I’m telling a Black story, and I can’t really pretend like I know what I’m talking about because I can’t pretend to be something that I’m not. So the only way that I imagined I could approach this material was with a lot of respect and with that outside perspective. I mean, that’s what the movie is about, isn’t it? Just someone trying to understand something that they never will be able to understand and the only way they can do that is by taking a step back and listening. That’s exactly what I did here. I knew that I was telling the story of two people that love their city and all of the complicated issues that come with that love. Sara Michelle Fetters: I think one of the great examples of that is the scene where we learn what Daveed did, what actually got him in jail. It’s very funny how it’s initially presented. But then you watch Daveed and Gavankar’s performances as they’re hearing this story told to them, a story they for obvious reasons already know, and it’s two different worlds processing the exact same thing but doing so in completely opposite ways. This is kind of where we’re at as a society in some ways right now, isn’t it? It’s a mirror. Carlos López Estrada: I think so. 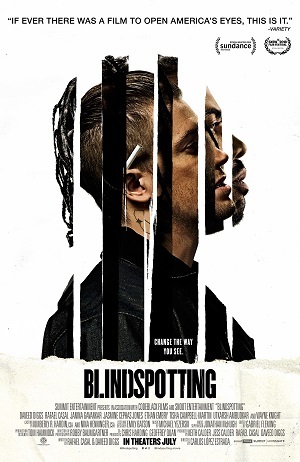 I mean, I think that really encompasses what Blindspotting is. It’s an entertaining movie that is fun to watch and is sort of like a sensory overload in every single way. It’s hilarious, and it’s bright and it’s colorful. But then somewhere along the way something happens that makes you take a step backwards and just realize it’s actually a little bit more than that, that there’s a lot of layers and this is actually a very complicated story. Something that was on the surface, just like a fun moment about two people getting into a fight, you realize there’s a lot more to it than that. Daveed and Rafa’s script digs deeper. Sara Michelle Fetters: Not to spoil anything, but I think a great example of what you’re talking about is how you deal with the gun. Sara Michelle Fetters: It took me a second to realize it, but if I you watch Rafa and the way he’s playing with the gun in that first scene, it’s very similar to how his son is playing with it later on. Carlos López Estrada: I’m glad you noticed that. Carlos López Estrada: I mean, I think I’d like to say that everything was on purpose, but that’s probably not true. In this case I think it was. What was most important was letting the actors sort of like find themselves while we were shooting. Of course we knew what the movie was about and we knew what we wanted to say and what we didn’t want to say, but there was always freedom to explore. I think the group of actors just became so close. We were able to foster this safe environment on set for people who were really just playing off of each other. But there were a lot of actors that just came fresh, knowing nothing about any of us, and I think the environment that we created allowed for this like really, really loose acting style. That’s where many of these choices came from. The playfulness that the kid has just came from how well he got along with his movie mom and dad, and that was important to us. So the stuff with the gun, it was born from all of that, I think. That was one of the things that was most important because the movie’s ultimately about people. It’s about a community. It’s about two best friends and it’s about relationships. Sara Michelle Fetters: With that accelerated schedule that you were talking about earlier, was it difficult to convince some of the more relatively well-known actors like Wayne Knight and Ethan Embry to come aboard? I mean, you’ve got Tisha Campbell-Martin here for gosh sakes. Carlos López Estrada: It was surprisingly easy, if I’m being honest, because the script was so good and people knew Daveed, knew Rafa or knew both of them from all sorts of different places. They’re all multi-hyphenated artists. They knew them from the rock world. They knew them from the theater world. They knew them from poetry circles. So we actually had all these different people that would come on for one-day roles that would just fly up to Oakland to be with us for that day and then fly back home because they wanted to be a part of the project. I think they knew how special it was. You know, it’s not just we were asking them to be a cop for a day or just come onto the set and play a judge. We were asking them to play someone who has in some way influenced lives and someone who is based on someone they might know. Blindspotting is just such a personal story that I think people were especially enthusiastic to be a part of it, whether large or small. Sara Michelle Fetters: There’s a pivotal point where you very easily could’ve gone into sort of Crash territory, and I actually like Crash. What I’m trying to say, I guess, is that there’s a point where the coincidences that happen are fairly extreme, and they could have become melodramatic and felt facile. Yet there is a powerful authenticity during these moments, especially as it pertains to Daveed’s magnificent performance. 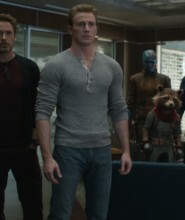 I mean, you guys all had to know what the inherent danger of these scenes, and yet somehow, someway, thanks to your direction and the work from all three actors, it’s all kind of incredible. Daveed also. What he’s able to accomplish in that scene. I feel like most other actors would have really struggled with giving a human performance with what he’s asked to do there. The asks in that scene are high. It’s a tall order to ask an actor to do what Daveed does and make it seem natural. I don’t really know what to attribute that to other than to see he’s really incredibly talented because I think we were all worried that the scene was going to come up and people were just going to like, roll their eyes and wonder why we would ever do anything like that. But you’re on board with the scene because hopefully we’ve done an okay job presenting this world inside the movie and making you care about these characters, showing you that even though this is a slightly heightened movie and it’s stylized it still deals with real people, real fears, real insecurities and real problems. By the time the last scene comes up you should be more concerned about what’s going on in Daveed’s mind more than in how exactly the scene plays out or how it’s executed. It should feel as real as anything else. I hope that makes sense. Sara Michelle Fetters: What do you want people talking about when they leave the theatre? What do you hope they’re saying to one another? Carlos López Estrada: I don’t know. I mean, it’s up to the individual, isn’t it? Maybe I shouldn’t be telling them what to think? I mean, we tried really hard through the entire process to not say too much. We tried to ask questions rather than give any kind of thoughts on what we think those answers could be. Every time we felt like we were turning a question into an answer we would pull back and say, we’re not coming into this movie pretending to have answers to the issues that we’re presenting. We’re trying to start a conversation, hoping that people walk away with enough to go home and talk to their friends or their families or their significant others about these issues that we present. Whether it’s race, whether it’s gentrification, whether it’s police brutality, we’re hoping that people are willing to listen and then talk amongst themselves. We’re not pretending to have any answers. If people who watch the movie walk away with that sort of reaction? I think we’ve done our job.